Optimal nutritional health is so much more than just what we eat, but also how we eat! Now, I am not going to tell you that gorging on roast Turkey, cranberry sauce; stuffing and gravy, with sweet potatoes, mashed potatoes, deviled eggs, green bean casserole; followed by apple pie and pecan pie, all washed down with copious amounts of alcohol and psychical activity limited to looking for the TV remote, is a particularly healthy way to spend a Thursday. Neither will I suggest that the – on average, according to the Caloric Control Council – more than 4,500 calories and 229 grams of fat you will ingest on Thursday alone, will improve your waist line, but I will tell you that the ‘singular focus’ of nutritional science on what we eat is only a small part of the story………..and that how we eat also affects our well-being! We are all too familiar with the biological dimension and the importance of balancing proteins, carbs and fats in the right proportions, but for this Thanksgiving please put it to the side. The negative thoughts you have around that second helping of turkey, or that extra slice of pecan pie can actually do greater internal damage to you than enjoying your food without guilt!!! Now, of course I am not promoting this for every day, nor even every week, and I strongly affirm the importance of the eating healthy foods, but at that this time of year it is ok for you to enjoy the second helping or extra slice of pie, and enjoy it without feeling like you shouldn’t — in fact that is the key to enjoying it! Instead of focusing on why you shouldn’t be doing something, focus on why you should, and so, go ahead, this Thanksgiving focus on the psychological, social and spiritual dimensions for a change! Putting aside the inevitable personality clashes that occur when family is gathered around a table – I often compare family to the two “like poles” of a magnet that for some reason however hard you try there is always friction! Nonetheless there is undoubtedly great joy to be had by sitting round a table with family, friends and loved ones. 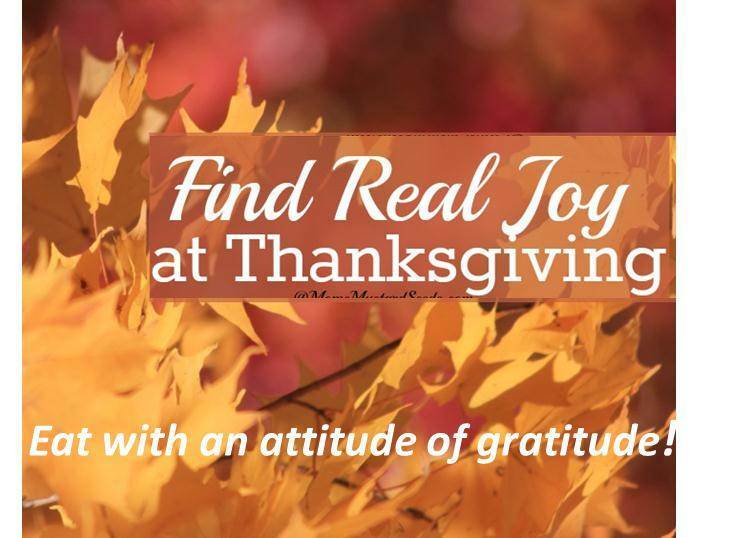 This Thanksgiving, put aside any minor family squabbles – and even major family squabbles – and instead simply focus on the Gratitude and Appreciation that you have people in your life to enjoy Thanksgiving with. Throughout the day, just take a few moments to yourself to feel Grateful that you have people in your lives. The key concept of psychological nutrition – or “food mood” as it’s been called- is that foods influence emotions, for example carbohydrates like potatoes release a hormone called serotonin which calms and relaxes you, but conversely our feelings and emotions also influence our food! Donald Morse, a physician at Temple University, found that when he asked students to meditate for 5 minutes before eating, they produced over 20% more of the alpha-amylase enzyme in their saliva, which helps to break down carbs and B vitamins in food. This suggests that if you eat in a mindful and present state, you can absorb more nutrients and improve your feeling of wellbeing! Feelings of doubt, anger or lack affect our stress hormones – inflating our cortisol levels – producing a toxicity that we digest into our body, we are literally ingesting these negative thoughts. Feelings of love, abundance, joy and appreciation do the exact opposite!!! So, this Thanksgiving, despite anything else that may be going on your lives, when eating your Thanksgiving meal eat it mindfully by being in the present moment, and eat with gratitude, appreciation, and love. It really can have a big impact on the way your food is metabolized! Food has long been a part of spirituality and faith, and all the major world religions have their own connection to the spiritual aspects of food. Among Christians, the miracle of the loaves and fishes in the New Testament – where Jesus was able to multiply a scarce amount into a meal for thousands – is well known. Likewise, for Jews Fasting on Yom Kippur, or celebrating Chanukah with Latkes (potatoes) is second nature. For Muslims, abstaining from food from sunrise to sunset over Ramadan is an annual practice. Indeed all the major world religions incorporate fasting or abstaining from certain foods, or the sharing of a communal meal such as Easter, as an important part of their spirituality. However, spirituality and food is now largely overlooked and goes unnoticed due to the fast pace of our lives! So, this Thanksgiving – whatever your religion or beliefs (or indeed even if you do not believe in religion or G-d) – please take the time to recognize the “non-physical” dimension of food when you sit round your Thanksgiving table with family and friends. All food depends on the same elements, namely the sun, the earth, water, and air, that we humans do. This recognition of “Life’ is the spiritual part of nutrition, and its True whether one does not believe in G-d, or if one is a Christian, Jew, Muslim, Buddhist or Hindu. Therefore this Thanksgiving, recognize that we all come from the same source (albeit in different physical forms) and acknowledge the beauty and connection between plants, animals and human beings and give gratitude and appreciation for the food on your plate and the sustenance they bring to your body and soul. Take the time to enjoy your food, leverage all your senses and be mindful of its appearance, smell, texture and taste! Enjoy the moment and pay attention to your thoughts as you eat and drink. Despite anything that may be going on in your Life, anything in your Life that may not be going quite as you planned, despite all the turbulence in the world and in your Daily Life, this Thanksgiving and Holiday Season go ahead and temporarily put aside the physical nutritional and health dimension of the food on your plate, and instead focus on the social, psychological and spiritual dimension of food, not just the biological. By doing so you will experience a state of well-being that leads you into a better appreciation of the Present and a higher state of consciousness, and will aid you in restoring balance and emotional well-being to your Life.